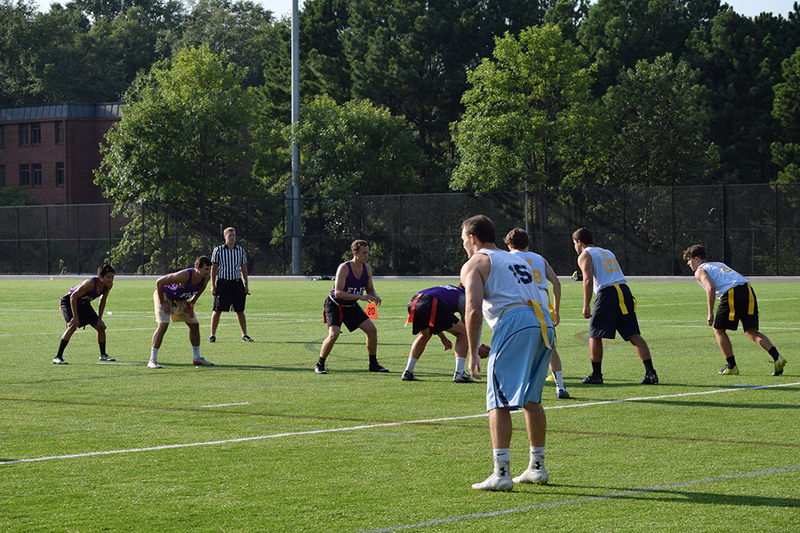 Intramural sports are a great way to be involved on campus and have fun with some friends. They provide a competitive outlet for students and allow them to forget about the stresses of schoolwork, if only for an hour or two per week. For these reasons, it can be incredibly frustrating when the games are not played. Too often, games are canceled or forfeited because one of the two teams simply does not show up. It is a problem that persists heavily in some of the less popular sports, but lately it has even reared its ugly head in seven-on-seven flag football, the biggest intramural sport on campus. The intramural office needs to fine teams who decide to no-show in order to curb its prevalence in the intramural community. This is now the third week (out of five) of the intramural flag football schedule, and at the time of this writing, my team has yet to play in an actual game. We feel robbed of a full season. We paid the $70 registration fee with the expectation that we would play five regular season games plus any playoff games that we earn. Instead, so far we have twice shown up to the turf fields ready to play, only to be turned away due to the lack of a competing team. If our registration fee were to be appropriated to each game, we would have already been cheated out of $28, just because the other teams are not honoring their commitments. In addition to the wasted money, no-shows are also a waste of time for the team who actually shows up. Our team arrives at the field one hour before the scheduled game time in order to warm up and conduct some light practice. In past seasons, we would also see the other team arrive and warm up as well and possibly chat with them for a little bit. This year, we warmed up alone, and as the start time drew closer, the slow, creeping realization that we would not actually have the chance to play that night dawned on us. Yet, we still could not leave, as games are not declared forfeited via no-show until the scheduled game time. We have been forced to stay for the remainder of the time, with our hopes of actually playing quickly fading, just to officially arrive at the unsatisfying conclusion of a win via no-show. Our 10-member team spent an hour preparing for each game, meaning that each opposing team unjustly wasted 10 man-hours of our time. Our team takes competing in intramurals seriously, and we have dedicated plenty of time towards developing and practicing a triple option offensive scheme. We had hoped to continuously improve it over the course of the season, analyzing its performance in each of our games. However, since we have not yet played a game, our offense is much further behind in development than where we would have liked it to be. This fact, combined with all of the lost team chemistry that is essential to playing in games together, puts us at a disadvantage compared to our competition, especially once the playoffs start. No-shows are not a rare occurrence by any means: 21 percent of all seven-on-seven flag football games in the independent division were forfeited via no-show last fall. The sheer amount of negative effects that no-shows cause, combined with their alarmingly high frequency, demands that the intramural office take preventive action. Currently, the intramural office does not punish teams who forfeit/no-show any more than giving them a loss for the game they skip. The most straightforward, proactive and effective method would be to implement monetary penalties for forfeits and no-shows, as money would surely motivate most people in this situation more than any other reasonable incentive. Schools such as UGA and MIT have monetary penalties in place for teams that forfeit games, so there is precedent for this type of system. It would be easy to implement, too: simply collect all of the money when the teams register, then refund it at the end of the season for every game which the teams attend. For example, instead of charging $70 to register, charge $70 plus $25 per game for a total of $195. If the team plays all of its games, they would receive a $125 refund at the end of the season. This would allow the intramural office to implement a fining system without having to worry about actually collecting the money from teams when they forfeit. Ideally, a fining system would greatly reduce, or perhaps even eliminate, the frequency of no-shows across all of the intramural sports. The frustration of a week’s worth of game planning, practice and preparation going to waste for reasons external to the team would no longer be associated with the intramural experience.